Aliens didn't build these ancient urban structures, but the Mayan culture that did is so remote (roughly 1500 years old) that their architecture feels alien. Partly this is because of the mysterious collapse of the urban Mayan empire, in which people abandoned the cities full of these giant monuments, moving into smaller cities and farm regions where the descendants of Mayans live to this day. These photographs, by Kenneth Garrett for National Geographic, capture the way an ancient civilization can seem alien to us in the present. In his book Collapse, geographer Jared Diamond describes how many anthropologists now believe that environmental factors like climate change caused the Mayan civilization to collapse. As rainfall grew scarce, the local farmlands could no longer support giant urban areas and finally the population scattered to other parts of Mexico and Central America. The stylized Mayan art looks a little bit scifi, and a little bit Art Deco. You can see more pictures of this ancient Mayan city at National Geographic. 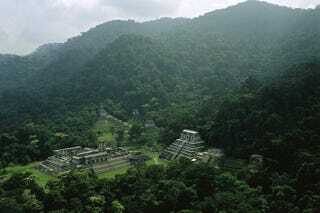 Mysteries of the Maya [National Geographic] Thanks, Marilyn Terrell!